At last, I've finished what must be the longest running deck project on Lady Jane. Finally, the footings for the winch and capstans, which were cut off before I bought the boat, have been filled in with concrete, flush with the rest of the deck. It's not that I've been working on this continuously. What had happened was I got so far, then the priority dropped right away once the old, rusty, steel was cut away and I had painted the things so they would not rust any more. What prompted the completion of this project was the arrival of the gazebo, which suddenly meant that getting the deck properly sorted became a priority again. It's that 'inside outside' concept at work. Both the pictures show the progress over time on this project. Regretfully, I don't have any pictures showing the original state of that big section on deck, when it was still half full of concrete with it's jagged metal protrusions. My thanks to Fred, that patient concrete mixer, for his help and advice with the cement. I'm so pleased this is finally complete. Pat, a fairly regular visitor to Lady Jane, was down to help again. I'm reminded to tell visitors to wear only old, scruffy, clothes when visiting Lady Jane. Pat's beautiful cream jacket bears testimony to the fact that we have been painting with bitumen paint again. I'm really grateful for the help, thanks Pat. I'm sorry to say that none of the ducklings have survived. Nobody really knows what happened to them, though any one of a number of predators could have got them, or they could simply have not survived the spell of awful weather we had recently. One theory is that the swans may have killed them, as they compete with the swans for food. The rust busting, meanwhile, continues. Weather and tide dependant of course. As you can see in the picture, I've nearly made it all the way to the centreline of the stern, which means I've cleaned up most of the hull on the starboard side. The muddy swans have, of course, temporarily halted work up forward until their eggs hatch. Although this section of the hull looks pretty bad it's not too difficult to work, as the rust is relatively smooth here and comes off fairly easily with a wirebrush. Where the blue paint is sound under the wire brush I'm simply leaving it, as I figure that more layers of paint can only be a good thing in the ongoing struggle against the rust. I also still have a strip just above the waterline all the way down the starboard side to rust bust, but before I do this I want to get more ballast on board to trim Lady Jane up correctly, so I can paint a neat waterline. 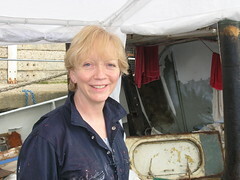 Although I really want to press on with the stern accommodation, if the weather is good I'd rather be working outside. Hurrah, welding in the stern accommodation space is now complete. You can see Robin putting the finishing touches to the welding on the new section of plate we put into the hull. 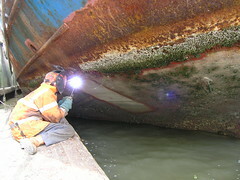 This is the last of several separate welding projects in this part of the boat, including repairing a drain pipe from the galley, patching holes drilled in the forward bulkhead, patching holes rusted in the stern bulkhead, patching a hole rusted through from the deck above and blanking the old shower drainpipe outlet in the hull. Now the pressure is on me to get a second coat of bitumen paint on inside. I want to do this bit well as, hopefully, it should last another forty years, or so. As soon as painting is complete, and a new sole (floor) is laid, I can get going with insulating the place, then fitting a plywood inner skin. I'm so looking forward to the stern accommodation being habitable at last. We have been having masses of wind and rain just recently, which inevitably means working down below. At this stage, working down below means painting with that black bitumen paint. Something that seems to take a lot of motivation to get started with. Unsurprisingly, it suddenly became pressingly important for me to swing by and visit Stuart, who I have not seen for some eighteen months now. I had also recently found some gear that was borrowed from him that needed returning. Here you can see Stuart posing in front of a selection of ribs of all shapes and sizes in his yard at First Wave Ribs. The wet patch down his front is on account of the fact that he's just come off the water in what must have been some fairly lumpy seas. Those of you who know me would have heard me mention Stuart, and some of his adventures. For those of you who don't know, Stuart is easily one of unluckiest people I know. In a recent misadventure, as you can see in the picture, Stuart lost a few of his teeth. Something about a combination of rough seas and a rib's instrument panel! Stuart has a heart of gold though, and will go to extraordinary lengths to help people. 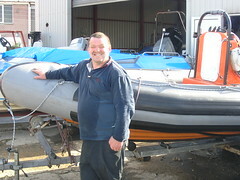 I first got to know him when he lent me, a complete stranger, one of his rib's to get to and from Lady Jane, out on the river itchen, after I bought her. My mate Andy came down to help on Lady Jane over the weekend. His visit prompted me to craft a bunk, rather than simply dumping a mattress on the floor which I've done when other guests have been to stay. After all, how hard can it be to make a bunk? Harder than it looks is the answer. My initial plan was a sheet of ply with a leg at each corner. Nope, far, far too wobbly. Next up, more struts and cross bracing with off cuts and bits and pieces of wood which were lying around. Nope, the legs still spread along the length with any weight on it. More bracing in the middle finally eased the legs spreading, but not completely. Given that Andy had come down to help, and the two of us had spent hours on the damn thing by then, we opted to call it quits and accept a little flexibility in the final product! 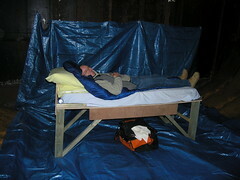 The picture shows Andy ensconced in the newly created 'bunk' in what used to be the fish hold. He is surrounded by a plastic tarpaulin which we put up to help make the place a little more pleasant to be in. Andy writes "Contact the AA and suggest they list the 'forward suite' in their Good Accommodation guide. You should get at least 3 stars! ", so it could not have been all that bad. I feel a trip to that internationally renowned Swedish furniture store, to see how it should be done, coming on. Bunks version two onwards will be much better thought out and built. I took the picture on the right then, after looking at it, thought 'I've seen this somewhere before'. Purely by chance, I'd taken the picture with the same bed linen as was in one of the original pictures sent to me by the previous owners before I bought Lady Jane. Interestingly, their title for the picture was "Temporary cabin in wheelhouse". Looking at the dates in the header of the original picture, I see it was taken on the 9th of May. Almost exactly two years before my picture. Can you see the differences? Click on the picture for a larger image. The bench/table to the left has no books or lamps etc. You can see the speakers for my mp3 player now. Like so much I've done on Lady Jane, the differences are not so much in the cosmetics, but in the underlying structure. Also, I'm a firm believer in the old adage - if it ain't broke, don't fix it! Slowly, but surely, more and more of Lady Jane is becoming a rust free zone. 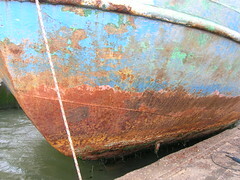 Asides for rust busting on the outside of the hull, which relies on the vagrancies of the tides and weather, there is increasingly less of the easy stuff to do. The main part of the foredeck being the last of the big easy outside areas. 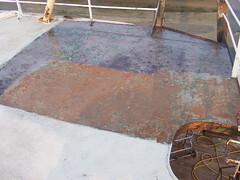 The bit you can see in the picture has now been primed, and that whole part of the foredeck is ready for a second coat. There is still the forward section of the foredeck to be started though. 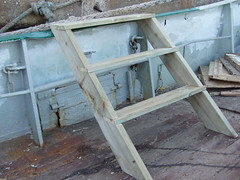 The plan is to put a set of steps either side of the foredeck, making access to that deck from the main deck much easier. With improved access and all painted up, I know the foredeck will be used much more. I'm studiously avoiding rust busting on the mast, not because I'm worried about heights but because it should be a two person job, one to belay, also the job needs good weather. The other areas I've so far avoided have been the overhanging part of the foredeck, simply because it will be physically harder than anywhere else, and the edges of the foredeck because access is difficult. It's all got to be done sometime. 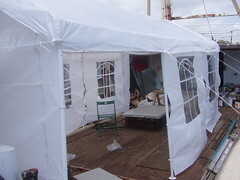 I bought a gazebo (marquee) to go on the main deck. To give you an idea of the size, it's 6 metres by 3 metres (18ft * 9ft). While I'm a little disappointed that it's not as weatherproof as I was expecting, it seems to do the business. I was expecting to feel sheltered when inside the gazebo, but was unprepared for just how much the simple addition of a gazebo contributed to the 'inside' space on board, even though it's outside. I found myself sitting there thinking 'this bit of the deck needs sweeping', something I'd not really considered before, as the deck has simply needed hosing down, or cleaning, once in a while. Now I should be able to work on deck even when it's wet and miserable. Mrs Duck's eggs have hatched. The little chicks are soo cute. I must have arived on Lady Jane only hours after the eggs had hatched, and already the ducklings were off the deck, into the water and around onto the platform which you see in the picture. 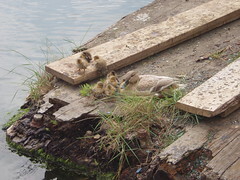 This pictue was taken when the ducklings were a few days old already. I spent quite some time just watching the little blighters swimming and scurrying about. They bob about like little corks and are quite capable swimmers, though the process of getting into the water from the platform can be a bit haphazard. Now I have the full use of my deck back, but seem to have lost the use of my platform. It often amazes me how it's the small things that make such a big difference. A few hours knocking up some steps to make getting on and off Lady Jane easier has made my life so much easier. Contrast that with the massive number of man hours spent in the shower room so far - and no result yet, with some way still to go on that project. After making the steps, I found myself thinking 'why didn't I do that months ago?'. The steps were in large part inspired by the set I saw on Wanderbird, though Captains Rick and Karen's stairs are somewhat more robust. 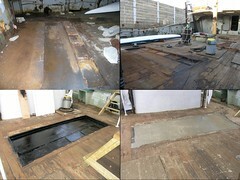 It's a small thing, I know, but the floor in the forward part of the wheelhouse is almost laid. 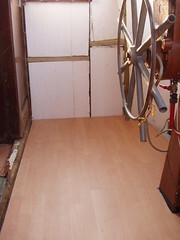 For the sake of a few hours work and less than ten quid (US$20.00) for the laminate flooring, it's been well worth it. More and more, the wheelhouse is becoming a haven from the dirt and mess that abounds on Lady Jane. Once ensconced in the bunk in the wheelhouse, by candle light and with music playing, it's a very cosy place to be. One of the first significant new electrical purchases on Lady Jane was an inverter. An inverter converts battery power, in my case 24V, to mains electric power, again in my case 240V. In this day and age it's almost impossible to do without some sort of mains electric available on demand, for any number of reasons - for example charging cell phones or running a refrigerator. Anyhow, not long ago my inverter suddenly stopped working. Despite the warnings on the cover, I opened the thing and tried replacing one of the fuses inside that had blown. My thinking was that I could not find the receipt and so was unlikely to have much success with any kind of warranty claim. The upshot of my attempt to repair the inverter was that it still refused to work and I was without mains power. 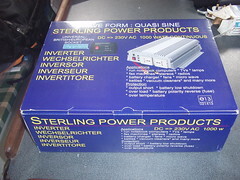 Thinking I had nothing to loose I looked up Sterling Power Products on the internet and gave them a call for advice on what to do. They cheerfully said I should return my inverter. I sent the thing in, expecting a big argument about invoices, warranty period, blah, blah. Imagine my surprise, and delight, when a few days later, completely unexpectedly, a brand new inverter turned up from them. That's what I call service. Thanks to the folks at Sterling Power. I'm making steady progress at the stern end of Lady Jane, while Mildred sits on her nest just forward of the bow. I compare progress on Lady Jane to that of a rising tide. If you sit and watch the tide coming in, you don't really notice any change. However if you look away for a while, then look back, you can see the progress made. 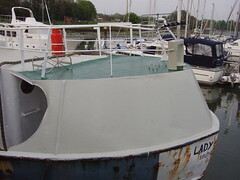 The picture shows a first coat of primer on the top part of the stern, and a start made with the green non-skid paint on the rear deck. Hopefully I'll get to rust busting the rest of the stern over the coming weeks, when I'm down on Lady Jane during the week and can make as much noise as I like. The steering room is also coming along nicely. 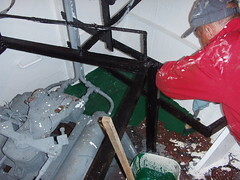 Here Fred is painting the deck with green Hempel non skid paint. Non skid paint on the deck is the last of the painting tasks in here. Next will be to build a workbench and storage space for the tools and equipment that I've amassed. Ultimately, the plan is that some tools will reside in their proper place in the engine room, where they are most likely to be needed, but that is quite a way off at the moment. It will be such a pleasure to finally have somewhere to store this stuff, as at present it's scattered about somewhat haphazardly on the deck above the engine room and crammed into the forward hold. The steelwork in the shower room is now complete, save for drilling a few holes for the hot and cold water pipes. 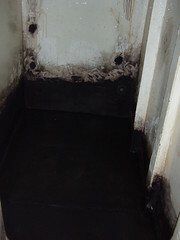 The picture looks grim, I know, but the black stuff is all brand new steel, coated with Rustroy and ready for priming. Once I've got a few coats of primer and some paint in there, it will all look so much better. With the place all painted, I'll be able to go ahead and install the mirror, shelf and hand basin I've had floating around underfoot for a long time now. That the mirror has not been broken is somewhat of a miracle. Looking back at a December 2004 entry in my blog, I see I bought that mirror at least 17 months ago. I don't expect the plumbing to be too much of a problem, using Speedfit fittings, then finally I'll be able to enjoy the luxury of a completed shower room. The amount of man hours sunk into that tiny space is unbelievable. I've had to build another box. This time it's to house a rather noisy 'silent' generator. The opportunity arose to buy a brand new, silent, 7KVA (5KW) diesel generator at a very reasonable price, so I jumped at it. The thinking being that I could do with a silent generator producing all the power I would need, in place of using my noisy old donkey engine. 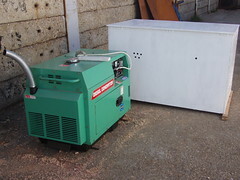 The first generator from Ecotrax was very noisy, so after some wrangling they agreed to exchange it. The second was a lot quieter, but certainly a long way from being silent, as sold. It even has a silent sticker on the front - what a joke. The upshot of it all seems to be that I could pay more than double to actually get a silent one, or put up with what I'd got. No point in arguing about it, so I set about silencing the thing myself with a box, which I'll line with sound absorbing foam or some such material. Ultimately I'll mount it up forward, in it's acoustic box, under the shelter provided by the front deck, but the duck nesting on deck means it needs to stay on the quayside for now, so she does not get disturbed.